Since microscopic slides can now be automatically digitized and integrated in the clinical workflow, quality assessment of these Whole Slide Images (WSI) has become a crucial issue. Until now, the quality of a WSI has been verified a posteriori by a technician or by a pathologist. There is however a significant amount of WSI that are too insufficient in quality (blurred, bad colors, poor contrast) to be used for diagnoses. These slides have then to be scanned again with delay thus slowing down the diagnostic workflow. To address this problem, we chose to design a method of quality assessment followed by reacquisition, as opposed to a process of enhancement or restoration [1, 2]. Such process indeed too frequently results in the degradation of image quality, a key factor in medical diagnosis. The quality of a flat image can be defined by several quantifiable parameters such as color, brightness, and contrast. One of the most important parameters, yet difficult to assess, is the focus sharpness (i.e. the level of focus blur) ). Quality assessment of WSI is much more complex than that of flat images because of their intrinsic structure made of multiple magnification levels (pyramidal structure) and resolutions above the gigapixel. One study  has shown the possibility of comparing the tiles' contrast and entropy in two WSI obtained with two different scanners digitizing the same slide. 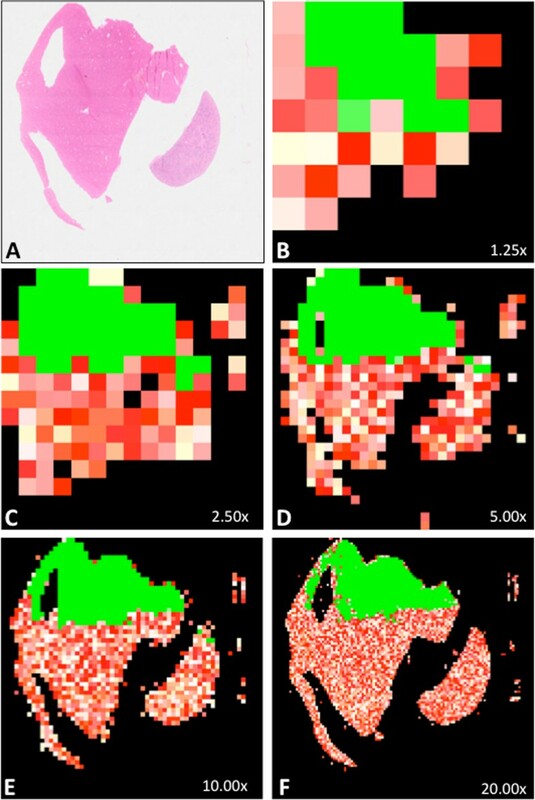 Another work  assessed the focus sharpness of the tiles of a WSI with the generation of a focus assessment map of the WSI at a given magnification level. However, both these methods still require a human eye to assess if the WSI must be accepted or discarded after the scan .The method we designed to automatically assess the quality of a WSI without any sort of comparison (no-reference assessment) has been patented  and thoroughly tested in the last four years. It is currently being implemented in our university-hospital Saint-Louis - Assistance Publique - Hôpitaux de Paris (APHP) - Université Paris Diderot - Paris 7, in Paris, France. It is also part of the FlexMIm project , which aims to improve the global workflow of digital pathology. This project, funded by an R&D grant of the French government for highly innovative technologies, also involves universities Paris 6 (LIP6 and IPAL laboratories) and Paris 7 (LIAFA laboratory) and industrial partners Orange Healthcare, Pertimm and TRIBVN as well as 27 anatomo-pathological centers in Paris and its suburbs. For these projects, we have developed two programming libraries, in Java and Python, that can be integrated in various types of WSI and image handling applications. The development has been carried out on a MacBook Pro Intel Core i7 2.6GHz, 16GB RAM, 512GB SSD, and the tests were carried out in University Paris Diderot Paris 7, with the following configuration: 2 Intel Xeon E5-2680 2.70GHz, 20M Cache, 8.0GT/s QPI, 24GB RDIMM, 1333MHz FBD RAM, 146GB SAS 6Gbps 15k RAID 1, 5 2TB SAS 6Gbps 7.2k RAID 5. 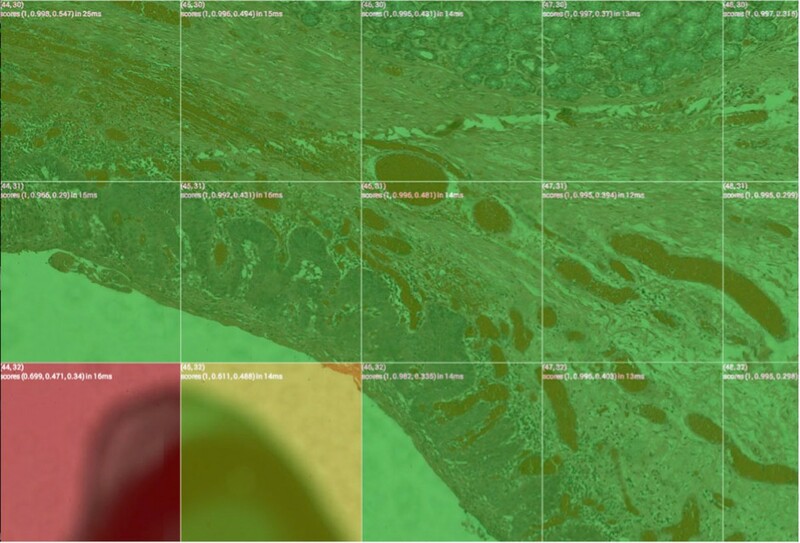 The tiles of each magnification level of the WSI need to be accessible to perform the analysis. Many open-source programs [9–11] as well as proprietary ones  can be used to extract WSI files from different formats (3dHistech, Aperio, Hamamatsu, Olympus) into series of tiles at different magnification levels. Any WSI can be converted, at a given magnification level, into a series of tiles or strips (wider tiles) indexed by their (x,y) coordinates. Once the tiles of each magnification level are extracted, the saturation of each of them is computed. In every system, many "blank tiles" are stored because they contain visual artifacts detected as regions of interest but do not contain any specimen. As these blank tiles have saturation values close to zero, our system discards them from the set of images to analyze, saving from 5% (when the sample takes most of the WSI) to 90% (in blank WSI, containing no sample at all) of the time required to complete an analysis of a virtual slide at maximum magnification. The remaining tiles are then analyzed with different tests such as blurriness, contrast, brightness and color. More tests can be integrated as plug-ins in the program. For the blurriness assessment we used our fast reference-free method designed to compute accurately the amount of blur in a single tile based on an edge brightness ratio . Other tests such as contrast, brightness and color assessment are a result of computations made on the tile's pixels values, compared with their respective thresholds. For instance, one test could be to check if more than 90% of the pixels color values inside a tile were contained in three ranges of color. Each tile receives quantitative and qualitative scores for each of the analyzed parameters and are compared to their respective thresholds. Note that the tiles can be virtually split to add granularity and refine the final assessment. For instance, at a 2× magnification, if more than 90% of the tiles are considered sharp, the complete 2× layer of the WSI is considered as sharp. If more than 70% of the 10× magnification is considered sharp, the 10× layer of the WSI is considered as sharp. Once the tile analysis is done, if the WSI passed the quality assessment tests at each processed layer of magnification, the WSI is suitable for further use. We first presented the 100 WSI in a random order to two observers from our research team. 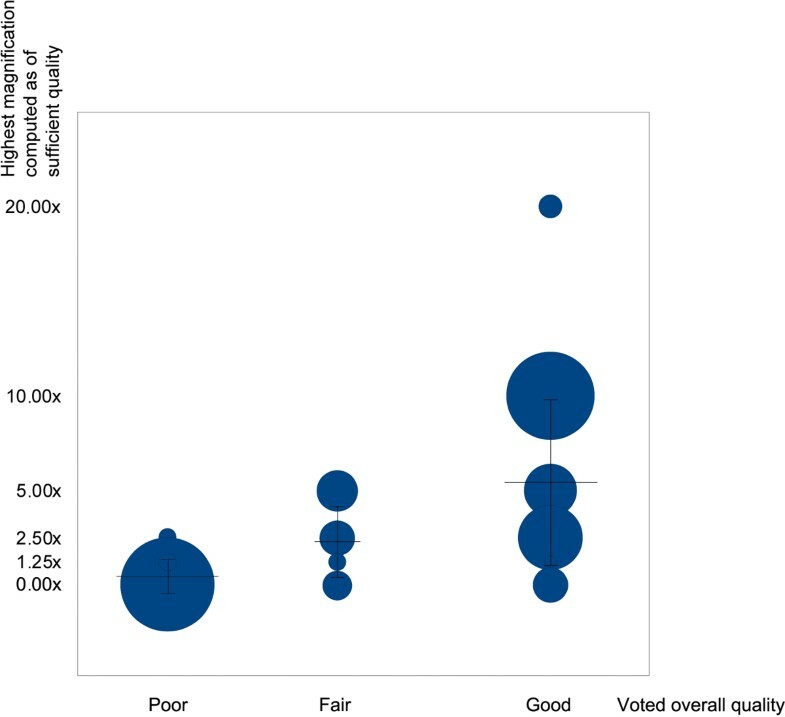 We then conducted a web survey  among 22 trained pathologists, asking them whether the overall quality of each WSI seemed sufficient for a clinical use. The human assessment was distributed among three possible answers: Poor; Fair; Good. The computer assessment represented the computed highest acceptable magnification for a WSI, higher magnifications being therefore considered by the computer as of insufficient quality for diagnosis. The libraries implementing the blur assessment method we designed have been developed in Java, Python, PHP5 and MySQL5 using Eclipse IDE, Apache HTTP Server. We also used the Google Maps API, as demonstrated in the NYUVM (NYU's virtual microscope, developed by NYU school of medicine) . Native reading of NDPI files was carried out using a modified version of Matthias Baldauf's NDPI to OME-TIFF Converter . Aperio SVS files were converted into the Google Maps format using VIPS and Openslide libraries . For the web survey, the results  obtained after the visual analysis on 100 WSI by 22 pathologists are shown in Figure 2. The results found by our algorithms are fully consistent with the pathologists' answers to the survey: the mean computer assessment is 1.25× with a standard deviation of 2.37× in the "poor" human assessment category, increasing to 2.90× with a standard deviation of 2.51× in the "fair" category and to 6.35× with a standard deviation of 5.57× in the "good" category. In terms of computing speed, Zerbe et al. showed a distributed computing model to assess the focus sharpness of a WSI, generating a focus assessment map of the WSI at a given magnification level in around 6 minutes per gigapixel per computer. We analyzed on our testing server 8 complete 1.73 gigapixel digital slides in 400 seconds as eight distinct threads, equivalent to 34 Megapixels per second or 2 gigapixels per minute, per computer. Already 12 times faster than the previous method, we are currently optimizing the program into a multi-thread, multi-node parallel processing system using C++ with OpenMP and OpenMPI libraries to scale it up to match demanding industry requirements. The WSI sharpness analysis Java library we designed is a Service Provider Interface (SPI): an Application Programming Interface (API) aimed at being extendable by third parties. 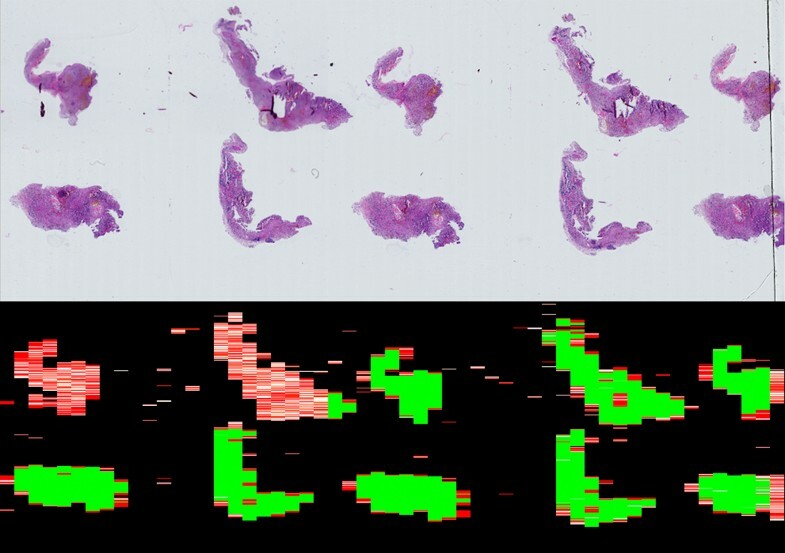 The full library (JAR file) weighs 12 KB and is fully operational for sharpness analysis of single images (tiles), and for array of images such as the WSI in Figure 3. The speed of analysis is in average 3 billion pixels by minute using our development environment with the JAI (Java Advanced Imaging) API. The Python mono-threaded interface was tested with an average rate of 1 billion pixels by minute. One java program using any regular image file (JPEG, PNG, TIFF, GIF, BMP...) or array of image files, and returning a list of values as described in our paper, with text-only results. One java program using WSI in the Hamamatsu NDPI file format, and returning global results for the slide sharpness at each magnification, as well as a sharpness map of the WSI summarizing the results with colors relative to the sharpness assessed (green for sharp regions, yellow for partially sharp regions, red for blurred regions). Implementation is shown in Figure 4. One java program using JPEG files structured as required by the Google Maps format: a tree structure containing folders numbered as such (starting with 0 and incrementing as required): Magnification-index/Y-position/X-position.jpg and returning similar results (text and image, as described above). One web application using JPEG files structured as required by the Google Maps format, to be viewed with the NYUVM. We connected our Java library to NYUVM by adding Ajax functions, triggering socket connections with PHP to receive a JSON array containing the results of the sharpness analysis for each visible tile, and display the sharpness results of each tile in real time. The sharpness analysis of the tiles are computed and sent concurrently and faster than the images are displayed, with no slow-down compared to the original NYUVM viewer, thereby in real-time . Implementation is shown in Figure 5. Programs 1., 3. and 4. also have Python implementations. Our Python implementations were 3-times slower in average than our Java implementations as we haven't yet used Python's multithreading capabilities. We are also currently developing multithreaded Python and Open MPI C++ implementation. Tests were made on 5000 single images, 200 WSI in Hamamatsu formats, 100 WSI in Aperio SVS format converted to the Google Maps format. It is currently being implemented in the French national project FlexMIm and additional results should be provided in the last quarter of 2014. In this perspective, we think that integrating these programs in the WSI acquisition systems can tremendously increase the quality of each scanned WSI without significantly slowing down the acquisition workflow. It will also most definitely speed up the quality assurance process, currently done manually after the WSI has been acquired, and by a subjective visual-only assessment. Implementing these libraries, coupled with regions-of-interest detection algorithms, may enhance intelligent image transfer protocols by sending and displaying the WSI's regions marked as being of interest and of highest quality before other regions. On another matter, image compression algorithms could be designed to favor sharp regions, by requiring lossless methods, and, on the contrary, accept lossy methods to be used on blurred regions. Should such quality assessment scores become part of the WSI's metadata, they may help standardize image quality requirements for digital pathology. As quality assurance is crucial in a context of daily use in diagnostic pathology, we have developed a fast and reliable no-reference quality assessment library for WSI and digital images in general. The proof of concept for this no-reference and high-speed quality assessment tool for virtual slide was developed in 2010, thoroughly tested and described in 2012. Development of Service Providing Interfaces and Application Programming Interfaces has been carried out in 2012-2014, and implementation started in French national projects in 2013. Applications based on these libraries can be used upstream, as calibration and quality control tool for the WSI acquisition systems, or as tools to reacquire tiles while the WSI is being scanned. They can also be used downstream to reacquire the whole slides that are below the quality threshold for surgical pathology analysis. We think that implementing these libraries could be used as an intelligent accelerator to viewing WSI by sending and displaying the regions marked as being of highest quality before other regions. Such quality assessment scores could be integrated as WSI's metadata shared in clinical, research or teaching contexts, for a more efficient medical informatics workflow. The authors are grateful for financial support from the FlexMIm project, the SATT idfinnov, and the French Agence Nationale de la Recherche (ANR). We also like to thank our colleagues in the Pathology Department of the Saint-Louis Hospital, the Hematology University Institute, the SATT idfinnov, the FlexMIm project and the University Paris Diderot's Laboratory of Algorithmic Informatics (LIAFA) who made all these experiments easier, and Julie Auger-Kantor for her immense help and support throughout this work. David Ameisen is a recipient of a postdoctoral fellowship grant from the FlexMIm project (2013-2014), and was a recipient of a doctoral fellowship grant from Aurora Interactive (2008-2011); Olympus provided him travel reimbursements for one scientific meeting presentation in 2008. None of these organizations are financing this manuscript. David Ameisen and Philippe Bertheau have published one patent (WO2012080643A1) relating to the content of this manuscript. They are receiving salaries from Université Paris Diderot that has applied for this patent. SATT idfinnov is currently funding this work (2014). No other author has financial competing interests. DA participated in the design of the study, the development of the libraries, and drafted the manuscript, CD carried out the Hamamatsu tiles extraction and participated in the design of the study, VP participated in the design of the study, FB participated in the statistical analysis, MB participated in the statistical analysis, LL participated in the statistical analysis, AJ participated in the design of the study, PB participated in the design of the study, and drafted the manuscript, JBY participated in the design of the study, the development of the libraries, and drafted the manuscript. PB and JBY have contributed equally to the work. All authors read and approved the final manuscript.